I pick on Starbucks sometimes when I’m teaching my Nutrition 101 course. It’s easy to poke fun at their 430+ calorie muffins and scones. (That’s a reasonable amount of calories for breakfast…until you add a drink.) I use their Frappuccinos as an example of the shocking amount of “invisible” sugar in our beverages. (The Grande White Chocolate Creme flavor has 11 teaspoons added sugar, not to mention 400 calories.) We see the single teaspoon of sugar we add to our coffee or the drizzle of honey we stir into our tea, but it’s easy to forget about the rest of it when it’s added in by food manufacturers, restaurants, and coffee shops before we actually start sipping. And more sugar = more calories. But for all my nutrition-based teasing, I am a regular Starbucks customer. I love the convenience, availability (they’re literally everywhere), predictability, and most importantly: the ability to customize my order. They have a reasonable selection of non-dairy milks (almond, coconut, and soy) which appeals to my vegetarian/vegan tendencies, and they will cater to virtually any crazy beverage concoction I can plug into my Starbucks app. It’s almost like they want me to be a high maintenance orderer. While the menu feels like it’s always evolving, I’ve come up with some favorite drinks that I order over and over. 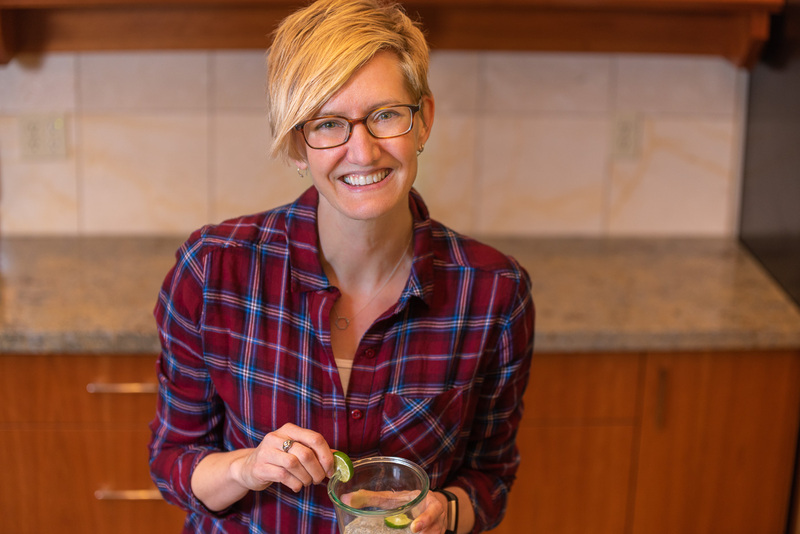 With all of their options for customization, there must be millions of possible unique drinks you can build, so this certainly isn’t an all-inclusive list of healthy choices; just a short list of this dietitian’s coffee and tea go-tos. 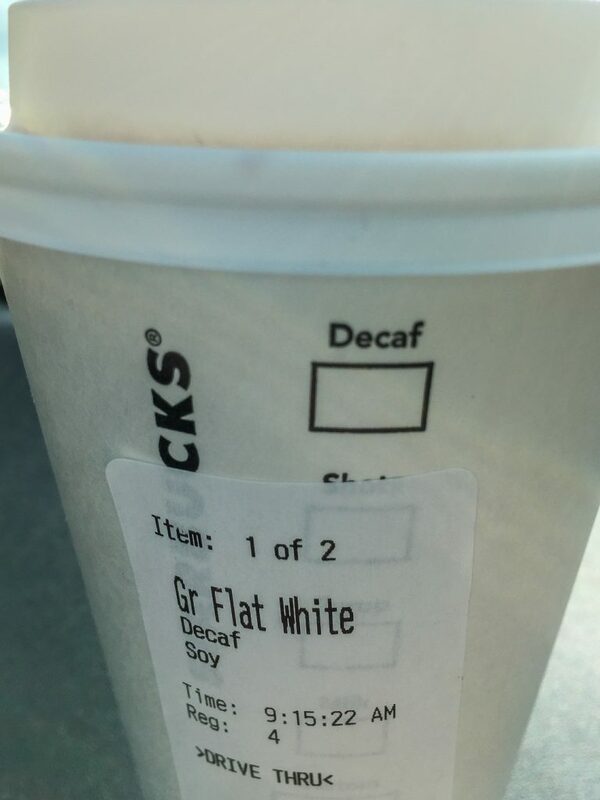 The Flat White is a marvelous invention, at least for those among us who sometimes find Starbucks coffee to be on the bitter side. The Flat White is made with their ristretto shots that aren’t quite as bold as the standard espresso. Sometimes I get it decaf, depending on the time of day and how much caffeine I’ve already ingested from green or black tea. This drink has replaced my long-time favorite, the Vanilla Latte. Same as the Flat White listed above, only iced. And bigger. For some reason I’m drawn to the venti when ordering iced drinks. I get this one partially made with decaf, though, since 4 shots of espresso would send my brain reeling for hours. The cold version tastes sweeter somehow and it is so refreshing on a hot day. When you just want iced coffee, with a touch of sweetness and creaminess, this is a nice option. From what I can gather from their menu and conversations with baristas, decaf is not an option for their iced coffee or cold brew. They only make the real stuff, straight up. This is 24 fluid ounces of cool, refreshing summertime liquid for a mere 50 calories. You can’t say that about soda, lemonade, or sweet tea. 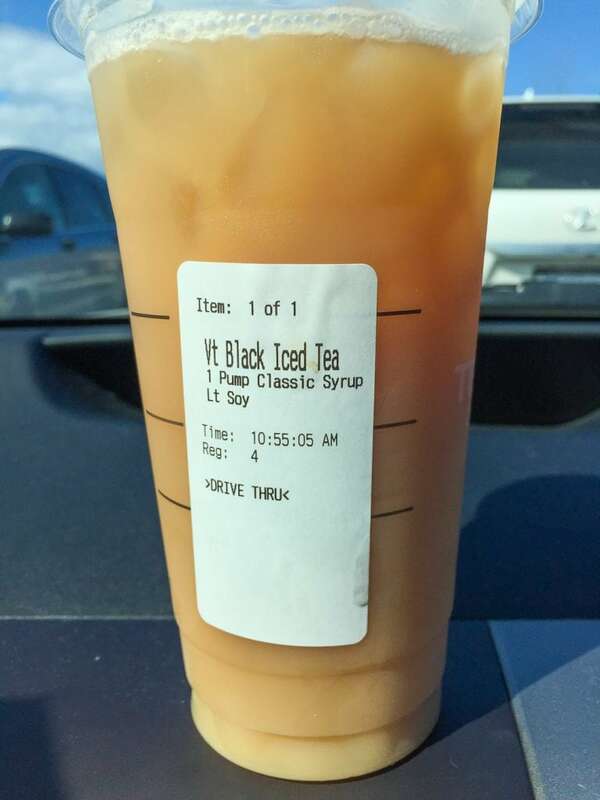 Unless you specify the number of pumps, a venti iced tea gets 6 of liquid cane sugar. Yikes! And I find it plenty sweet with just one, but you could compromise and just do 2 or 3 and still be ahead of the game. Pretty much the same recipe as above, but for when you’d prefer a caffeine-free iced tea. Be warned…the milk can curdle a bit but you just have the swirl the cup to get it all mixed in. (This recipe is awfully close to the off-menu item at Starbucks called The Purple Drink.) It tastes fresh and fruity, and for some reason reminds me of a summertime treat from my childhood: Dairy Queen Mister Misty Freeze. This was basically a slurpee or a slushy blended with DQ soft serve. I always opted for grape or cherry and loved the combination of fruit and cream. This is a very close facsimile as far as my tongue is concerned. Ridiculous to order, delicious to drink. 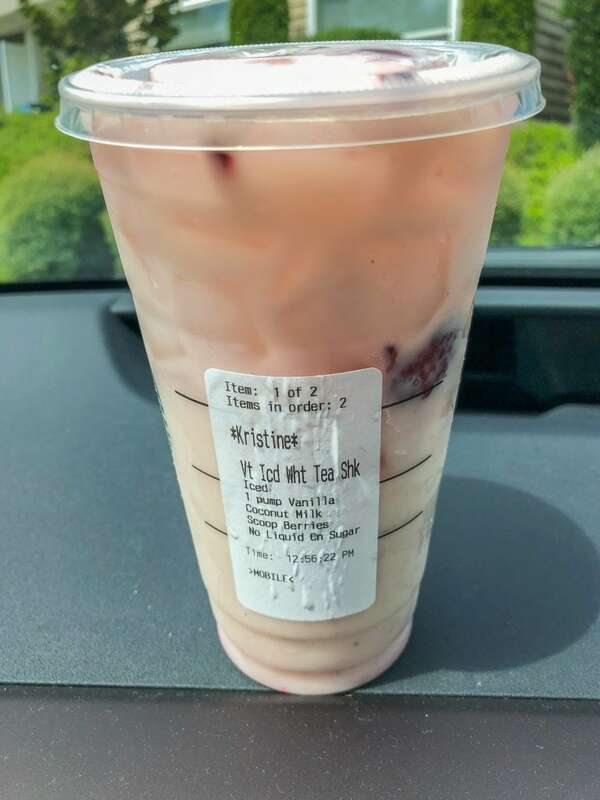 When I went through the drive-thru last week and got this, the barista said with a smile, “How did you ever come up with this drink?” Basically I picked iced white tea from the Starbucks app, and then just started clicking through each option for customization, with a goal of keeping the calories under control. I actually love the app because it saves me from having to speak my ridiculous order aloud into the speaker. Somehow sending it electronically and picking it up at the window is less embarrassing than telling it to a real human being, especially for an order this long. As far as the numbers go, I’m making educated guesses on the calories for some of these since they aren’t all straight from the Starbucks regular menu. The syrups (like cane sugar or vanilla) are 20 calories per pump and the white chocolate sauce is 60 calories per pump. For light soy I guessed an addition of 2 fluid ounces or about 30 calories, which would be 20 calories for almond or coconut milk. A quick note about other nutrients in the non-dairy milks. Almond and coconut will provide the fewest calories, but I usually opt for soy because it offers more protein. Almond and coconut have around 1 gram per cup while soy generally has 8 grams. 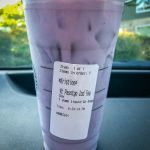 If none of my suggestions look like they’ll tickle your taste buds, check out the list Starbucks compiled of drinks under 200 calories for inspiration. You can really get creative. One of my favorites used to be a Grande Two Pump Toasted Coconut Cold Brew but I just tried to order it recently and was told they don’t have the toasted coconut syrup anymore. Really, though, any iced coffee or cold brew with some judicious additions would end up being pretty modest in calories. Hot tea is always lovely, is served unsweetened, and is essentially calorie-free. My favorite is the Emperor’s Cloud green tea. And as you can see from my recommendations above, iced tea of any type is also a smart choice, but their default is very, very sweet iced tea so I like to dial it down a bit. What about something to munch on alongside your carefully crafted drink? Ordering food at Starbucks is a whole other blog post, but I can tell you what I get most often. I opt for the 8-Grain Roll or Petite Vanilla Bean Scone at breakfast, and the Cheese and Fruit or PB&J Protein Boxes at lunch. I’m continually on the lookout for the Lentils, Veggie, and Brown Rice Bowl which I found on their website but the stores I visit never seem to have it. I’m pretty satisfied with my 6 favorite drinks, but with all of the recent additions to their menu like Cold Foam Cascara Cold Brew and Iced Cinnamon Almond Milk Macchiato, I think I’ve got some experimenting to do. I’m guessing I’ll find some new extravagant drinks to hold up as bad examples in class, but hopefully also discover some new thirst-quenching, modest-calorie sips that I can feel good about ordering this summer, high-maintenance or otherwise. I’m sure there is some wonderful customized beverage I have yet to try. What are your suggestions? Iced grande mocha with 2% no whipped cream. Soy will destroy you. Sounds like you’re not a fan of soy, which is OK. But I can tell you as a dietitian who has reviewed the research that soybeans are a whole food and the products made from soybeans like soymilk, tofu, and tempeh are considered healthful dietary choices. If I thought soy was unsafe I wouldn’t buy it for my family. Is it true soy is bad for people with thyroid problems? I really want to try the white tea but scared to try it. How good is it? It’s good, but very mild. It doesn’t have a strong flavor. Love soy!!! Milk isn’t good for you since it leads to increase risk of cancer (which is why cancer patients are told to omit). What do you think about cafe latte with soy in relation to someone trying to lose weight? Hi Sarah. A plain soy latte is pretty low in calories. A grande soy latte at Starbucks has 190 calories. That would be higher, of course, if it was a flavored latte because of the added syrup. 190 should easily fit into most calories budgets for the day for someone trying to lose weight, but overall it’s a good idea to limit calories from beverages and choose mostly water. Is there a reason why none of your drink recommendations have coconut milk in them? Hi Shawnie. Thanks for your question. I do order soy most often but the very last drink in this post uses coconut milk. 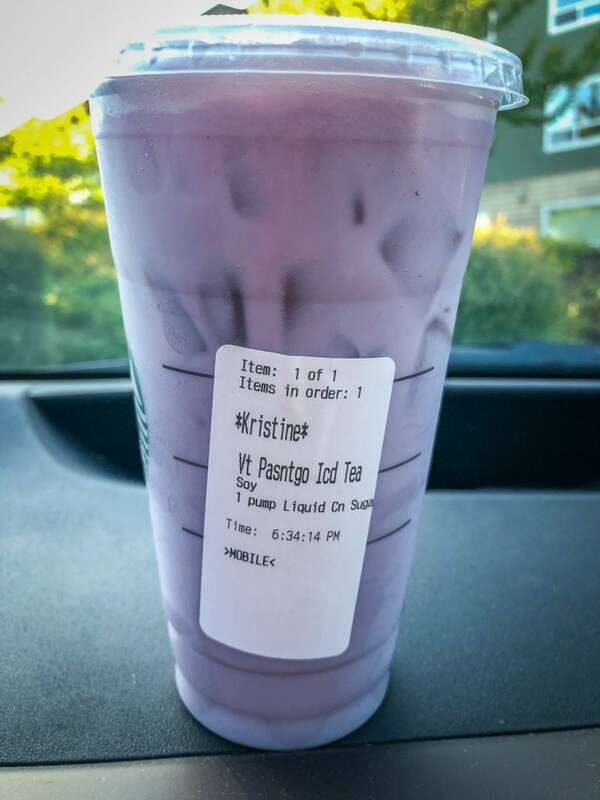 It starts with “Iced venti 1 scoop blackberries…” Hope this helps. Hi Natalie. I’m so glad you found the post useful. It was a fun one to write. Happy ordering! Starbucks dairy alternatives are actually not good for you at all, the amount of sugars in these are horrible for you. Any of their sweeteners, besides the Liquid Cane are like big macs in liquid form, no joke. Example, Grande White Mocha, more calories and bad calories than a big mac MEAL. So, if you use real world ingredients I am sure these wouldn’t be too bad for you, however, use starbucks syrups and milks, you are hurting your body either way. Hi Christy. Thanks for your comment. I do disagree, however, with the the blanket statement that none of the dairy alternatives at Starbucks are good for you. I choose the soy milk for the protein content though it does have sweetener. But their almond milk is a lower sugar option. 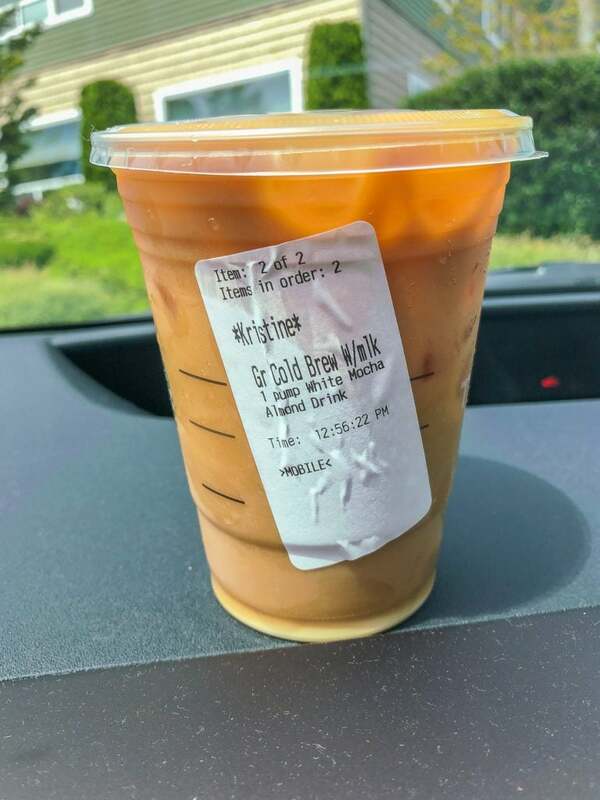 (https://www.self.com/story/nutritionists-review-starbucks-almondmilk) I also wouldn’t say the Liquid Cane sugar has any distinct advantage over their other sweeteners. A sweetener is a sweetener and we should strive to eat less of tall of them. I do agree that it would be best to only drink water if we wanted the best beverage possible with the lowest calories and no sugar, but I wrote the post to give some slightly better alternatives to the typical Starbucks menu items since many people shop there. As you note, the Grande White Mocha has a lot of calories, so my suggestions use far fewer pumps of sweetener and two of them have no added syrups at all. 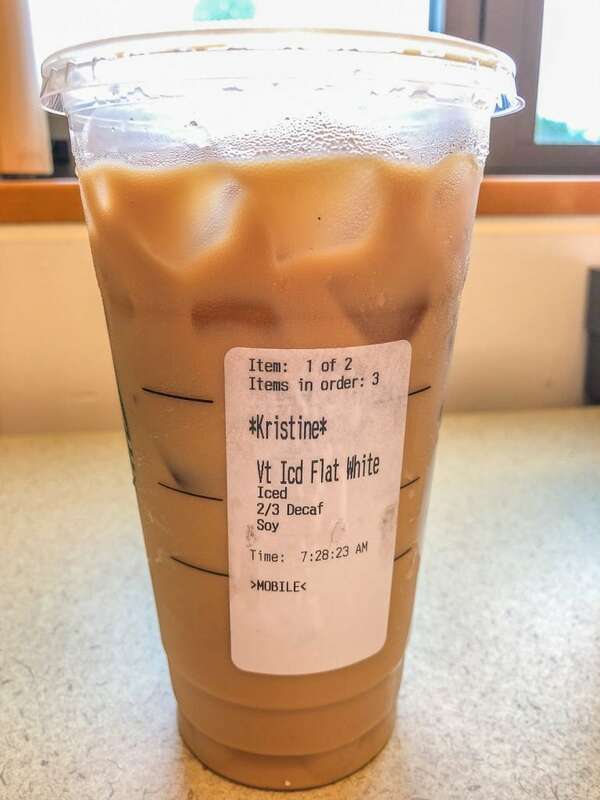 Venti iced cold brew…2 pumps sugar free vanilla, 2 pumps skinny mocha, splash of coconut milk! So good! Venti decaf single ristretto almond milk latte with cinnamon powder steamed in. Thanks! I am totally trying that!